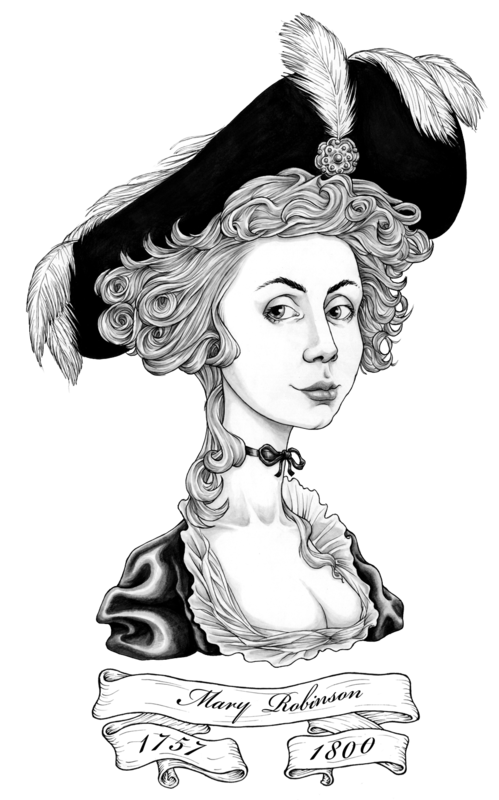 Once again I am delighted to feature the work of the estimable Mr Gareth Southwell, as we bring you the second notable to be honoured with a place in Madame Gilflurt's Georgian Gallimaufry. A popular lady and one for whom there were many requests, it is my pleasure to share with you the story of an actress, her prince and a decidedly unhappy ending. Mary Darby Robinson was many things in her eventful life, including a poet, writer and leading lady but it is in the latter capacity that we find her for our tale. As a child her dancing and dramatic skills brought her to the attention of no less a man than David Garrick himself, who saw in her a great talent. Under his tutelage she thrived, earning a place opposite the great leading man in King Lear and for a time, she seemed destined for the highest echelons of the theatre. As it so often would though, fate had other plans in store for the young lady and she found herself and her siblings struck down by smallpox. To the rescue rode a lowly yet gentlemanly clerk named Thomas Robinson, with whom Mary's mother was most enamoured and as he brought entertainment, sympathy and understanding to the unwell youngsters, the fifteen year old Mary swiftly deduced that he had something other than nursing on his mind. As Mary began to recover, Robinson requested her hand in marriage and the young lady accepted, her dreams of theatrical triumph apparently set aside forever. However, it was not long before Mary realised that her husband liked the high life but lacked the income to live it. With no prospects or inheritance, the couple struggled on unhappily and when Mary, her husband and their infant daughter were placed in a debtor's prison, Mary decided that the time had come to live life on her own terms. Mary went back to the theatre in 1776, starring in Romeo and Juliette and winning the acclaim and the hearts of her audience. Word of her talent and beauty spread far and wide and when the seventeen year old Prince of Wales watched her performing as Perdita in The Winter's Tale in late 1779, he was hooked. Soon he was writing her breathless love notes, addressed to Perdita from Florizel, and the attraction which would prove so damaging was also, sadly, mutual. For a time Mary resisted the prince's entreaties to meet in person but once she capitulated, the stage was set for a most passionate affair. George offered Mary £20,000 if she would leave her husband and the stage forever to be his mistress and Mary, rather swept away by it all, accepted. In fact, her acceptance seems to have been the very thing that cooled the prince's ardour after such a breathless pursuit and in 1781 he decided that he did not like Mary half as much as he had initially thought, refusing to see the actress or correspond with her and giving her not a penny of the promised annuity. The press were merciless in their mockery of Mary's situation and the unhappy woman withdrew into herself, dismayed at the situation in which she found herself. Afraid to return to the stage thanks to the public outcry once news of her liaisons with the prince emerged, Mary found herself in debt and set about trying to secure the promised £20,000. Despite efforts on her behalf by senior political figures Mary's efforts were unsuccessful and she was eventually forced to accept an annual income of £500. By this time Mary was still only in her early twenties and her name was already synonymous with scandal, a situation from which she would struggle to distance herself. Further drama awaited the unfortunate Mary but she is remembered now not only for her scandals, but for her talents as a writer and actress too. Her memoirs are a fascinating glimpse into life for a woman in the glorious Georgian era and it is a delight to feature her here! Poor Mary. Kings and Princes are destined to love the chase, and like most men of that era, the ardor cools. She's lived a lifetime in a few years. Debtor's Prison must have been a horror. Moral to the story. Never trust a man?